Fiona Pardington: The Pressure of Sunlight Falling, edited by Kriselle Baker and Elizabeth Rankin, (Otago University Press, 2011) 160 pp., $120. A ‘museological’ orientation distinguishes a range of photography that engages in fresh ways with historical spaces and artefacts. Thomas Struth’s long-term project ‘Museum Photographs’ observed the observers — the audiences that are such an essential component of displays in museums — while the uncanniness of Candida Höfer’s 2006 photographs of the Louvre’s galleries depended in part on the absence of any human users. In New Zealand, museums sit alongside other memorial sites in Laurence Aberhart’s oeuvre, while Neil Pardington’s recent series explored the aesthetics of museum storage. Occasionally, such projects succeed in completely redefining a historical topic. One example is Rauru: Tene Waitere, Maori Carving, Colonial History, edited by Nicholas Thomas and published by Otago University Press in 2009, which showcased Mark Adams’ photographs of Waitere’s innovative carvings and the international contexts they inhabit. Rauru also featured historical images, an essay by Thomas and insightful perspectives from James Schuster, a great-grandson of Waitere’s, and Lyonel Grant, a leading contemporary carver. 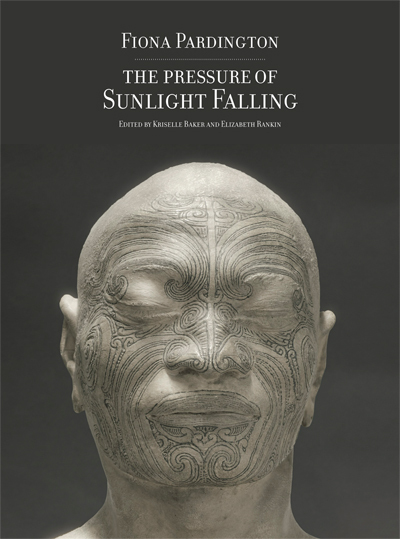 Otago University Press now gives us Fiona Pardington: The Pressure of Sunlight Falling, an even more spectacular exploration of this fascinating interface of art and ethnography. Full-page plates reproduce Pardington’s sombre, almost monochrome photographs of casts made from living models by Pierre-Marie Dumoutier, the phrenologist serving on the last great scientific voyage by the French into the Pacific. The photographs are accompanied by an impressive array of images and essays that explore the significance of Dumoutier’s work and its relationship to nineteenth-century anthropology. The elegant design is the responsibility of Neil Pardington, the photographer’s brother. Usually termed a ‘pseudo-science’, phrenology was a popular pastime of the early nineteenth century that purported to reveal inner truths — much like psychoanalysis in our time. Naval commander Dumont d’Urville was flattered by a favourable reading of his cranial bumps received from a London phrenologist; when this was repeated in Paris he became a convert and secured Dumoutier’s services for the expedition to the South Seas. Charged with forming a collection of skulls and head-casts to support d’Urville’s racial mapping of the Pacific, the phrenologist produced the moulds for some fifty life-cast busts that — back in Paris — were photographed using the novel technique of daguerreotypy and published as lithographs in an atlas documenting the expedition’s anthropological discoveries. Pardington’s connection with the casts, which are now held by the Musée de l’Homme in Paris, originated with Ngāi Tahu’s knowledge of the portraits made at Otago in 1840. Takatahara (known to Dumoutier as Taha Tahala) was a Banks Peninsula chief who played a leading role in the wars of the 1820s and 1830s between Ngāi Tahu and Ngāti Toa and is related to the photographer. The other Ngāi Tahu male portrait depicts Piuraki or John Love Tikao (Poukalem), who was taken prisoner by Ngāti Toa in 1831 and later travelled the world, living in Bordeaux and London. Fluent in French and English, Piuraki was also at Otago at the time of the French expedition’s visit in March 1840. Together with the portrait of a female subject, Heroua, these South Island casts represent the ancestral connection and catalyst for the project. The subject of a life cast is effectively a co-author of the resulting artefact and, given the deployment of a negative mould to produce a positive image, Pardington recognises an affinity between life casts and photographs. While this series represents her first foray into digital photography, which transcends the negative-positive dialectic, the works are nevertheless imbued with an antiquarian aura. Apart from the impressive scale and immaculate surface of the exhibition prints, and the wilful manipulation of colour, it is noteworthy that Pardington consistently rejects the three-quarter orientation of European portraiture (which is how the busts were documented in the photographically derived lithographs of d’Urville’s atlas) in favour of a more severe pairing of frontal and profile views, and even some views of the backs of the busts. These formats are intriguingly reminiscent both of the racial profiling of nineteenth-century ethnography, and of the criminal profiling system developed for the Parisian police by Alphonse Bertillon. Scholarly essays are interspersed with the plates, some of which fold out. The artist’s gradual discovery of and interaction with the life casts is discussed by the book’s editors, Kriselle Baker and Elizabeth Rankin, while David Elliott — artistic director of the 2010 Sydney Biennale where the photographs debuted — profiles the trajectory of Pardington’s career. Kriselle Baker’s essay, ‘The Truth of Lineage: Time and Tā Moko’, focuses on the significance of Māori tattoo and its representations, while anthropologist and Pacific historian Nicholas Thomas sketches the broader story of the voyage and the ‘archival turn’ exemplified by contemporary artists who engage with the legacy of colonialism. French curator Yves Le Fur, in ‘Dumoutier’s Artifacts’, and Elizabeth Rankin, in ‘Facing Difference: Casts as Documents and Display’, furnish interesting contextual information regarding the history and status of Dumoutier’s work. Further essays come from Stacy L. Kamehiro, whose ‘Documents, Specimens, Portraits: Dumoutier’s Pacific Casts’ offers a nuanced reading of the quest for races and types, and Ross Calman, who gives a Ngāi Tahu perspective. The final contribution is by anthropologist and Pacific historian Anne Salmond, who muses on the mechanics of casting a head in plaster and finds it difficult to believe that Māori chiefs would allow such a treatment of their heads. Fiona Pardington has formerly engaged with museums and their collections, photographing birds’ nests and feathers at the Otago Museum, huia specimens from the Canterbury Museum, and hei-tiki from the Okains Bay Māori and Colonial Museum. I was reminded of the hei-tiki photographs recently, when reading David Eggleton’s critique of Damian Skinner’s interpretation of the artefact photography of Brian Brake. Skinner argued that, by suppressing ethnographic clarity in his dramatically decontextualised images, Brake had ‘aestheticised’ the taonga of Te Maori. A similar play of dark and light — together with an equivalent decontextualisation — characterises Pardington’s approach to artefact-imaging. Far from the dispassionate objectivity of Mark Adams’ Rauru photographs, Pardington’s images of the plaster artefacts partake of a moody neoclassicism. Elizabeth Rankin concludes her essay by discussing the renunciation of colour in Pardington’s photographs and claims that they will ‘write another chapter in the history of Dumoutier’s heads’. Since this book will now be the essential reference for Dumoutier’s Pacific work, Pardington’s draining of colour from her prints does present a slight problem. Dumont d’Urville claimed credit for mapping the racial divisions of the Pacific and named the darker-skinned islanders Melanesians, in distinction to the copper-coloured Polynesians. Yet this crucial distinction — signalled in part by Dumoutier’s careful painted calibration of skin tone — is precisely what Pardington has collapsed by filtering the colour and thereby blurring the full story of the busts’ contribution to an important episode of racial profiling. One remedy might have seen the book’s historical images supplemented with standard (‘non-aestheticised’) photographic documentation of selected busts. Dumoutier’s life casts proved insufficient for their intended anthropometric purpose: the characterisation of separate Pacific races as determined by head formations. But with the passage of time they have become precious, almost magical documents that collapse time and distance: indexical imprints made through the collaboration of a French phrenologist and the Pacific peoples themselves. That is why the casts have had a busy exhibition itinerary in recent times, in which the Māori ‘specimens’ have played a prominent role. All four Māori busts returned to New Zealand in 1991 for a National Library exhibition of early French artists’ work in the country. A selection of the Pacific busts travelled to Sydney in 2002 for a Dumont d’Urville exhibition, at the same time as the elaborately tattooed Matoua Tawai (a portrait cast in the Bay of Islands in the month following the Otago portraits) was starring in exhibitions of life-casting staged in Paris and Leeds. The Musée du quai Branly, marking its 2006 opening with a vast exhibition of European depictions of the ‘other’, placed one of Dumoutier’s Māori busts into a compelling line-up of casts. Now, in the form of Pardington’s sumptuous digital photographs, these ethnographic artefacts have completed their metamorphosis into spell-binding works of art. ROGER BLACKLEY teaches art history at Victoria University of Wellington. He was formerly curator of historical New Zealand art at Auckland Art Gallery Toi o Tāmaki.